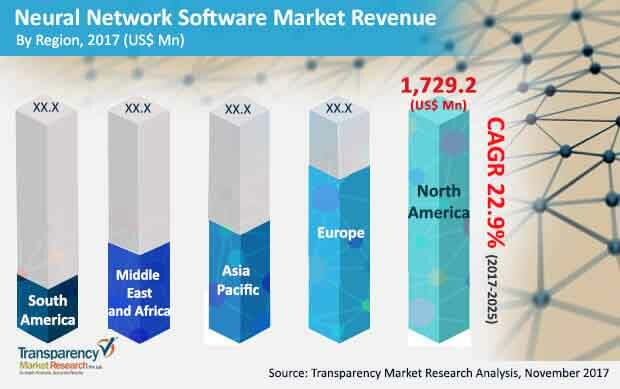 The “Neural Network Software Market (Software Type – Data Mining and Archiving, Analytical Software, Optimization Software, Visualization Software; Industry Verticals – BFSI, Government & Utilities, Healthcare, Oil & Gas, Manufacturing, Telecom and IT, Retail & E-commerce, Others) – Global Industry Analysis, Size, Share, Growth, Trends and Forecast, 2017 - 2025”, report provides analysis of the neural network software market for the period 2015–2025, wherein the years from 2017 to 2025 is the forecast period and 2016 is considered as the base year. Data for 2015 has been included as historical information. The report covers all the major trends and technologies playing a major role in the neural network software market growth over the forecast period. It highlights the drivers, restraints and opportunities expected to influence the market growth during this period. The study provides a holistic perspective on the market’s growth in terms of revenue (in US$ Mn) across different geographical regions, namely North America, Europe, Asia Pacific, Middle East & Africa and South America. Report highlights the key trends affecting the market on a global scale. Furthermore, region wise prominent countries/regions covered in the report includes - the U.S, Canada, Germany, France, the U.K., India, China, Japan, GCC, South Africa and Brazil. The market overview section of the report showcases the market dynamics and trends which includes drivers, restraints, opportunities that influence the current nature and future status of this market. It also provides an overview about the key market indicators given across the five geographical regions. Under the porter’s five forces analysis section, a brief analysis of the level of competition within the neural network software industry is given and business strategy is provided in order to determine the competitive attractiveness and intensity of the neural network software market. The report also includes key industry developments covering significant advances made by leading market players over the period of time. The report provides competitive landscape of the neural network software market, thereby listing out all the major players according to their geographic presence, market attractiveness and recent key developments. The competitive landscape section of the report gives an overview about the market share of several key players for the year 2016. The neural network software market data estimates are the result of our in-depth secondary research, primary interviews and in-house expert panel reviews. These market estimates have been analyzed by taking into account the impact of different political, social, economic, technological, and legal factors along with the current market dynamics affecting the market growth. Factors including market position, offerings and R&D focus are attributed to company’s capabilities. This section also identifies and includes various recent developments carried out by the leading players. Moreover, key takeaways section provided at the end of competitive landscape section would help the operating companies to make the best move in the market. Microsoft Corporation, SAP SE, Oracle Corporation, IBM Corporation, Google Inc., Intel Corporation, QUALCOMM Incorporated, Afiniti, Alyuda Research, LLC. and Neural Technologies Limited are few of the key players which have been profiled in this study. Details such as financials, business strategies, SWOT analysis, and other such strategic information pertaining to these players has been duly provided as part of company profiling. On the basis of software type, the market has been divided into data mining and archiving, analytical software, optimization software, visualization software. Owing to growth of unorganized and spatial data and need to classify this data to execute analytical and predictive operations, data mining and archiving segment is expected to show significant CAGR over the forecast period. In terms of industry vertical, the market has been segmented into BFSI, government & utilities, healthcare, oil & gas, manufacturing, telecom and IT, retail & e-commerce and others.